The rise of new developments will transform the landscape of the Pearl of the Orient even more dramatically in the years to come. Penang has become one of the most sought-after areas for residential developments in recent years, thanks to the constantly improving transportation links, political stability, booming manufacturing sectors and the growing appreciation of land. With the latter commodity becoming increasingly scarce, it is amazing to think that an entire metropolis, is set to rise majestically from the island’s south-eastern coast, in the coming years. 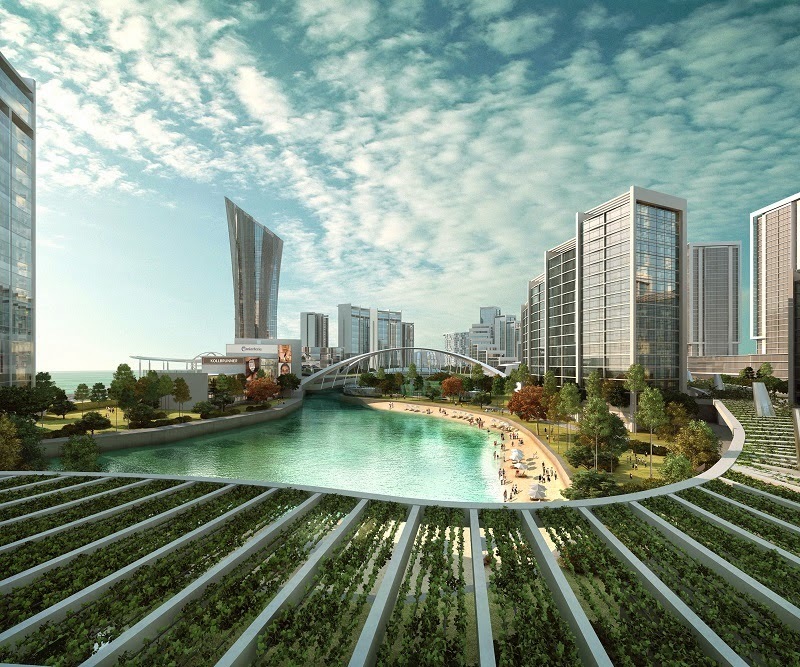 Penang WorldCity, a mixed integrated waterfront development spanning 103 acres (42 ha), is poised to transform the area’s skyline. When complete, it will be a modern, mini-international city where residents can enjoy refined lifestyles. This joint venture project by renowned Penang developer Ivory Properties Group Bhd and Tropicana Corporation Bhd (noted for its successful resort developments in Kuala Lumpur and waterfront developments in Johor) will be developed in phases over the next 10 years. The development will comprise approximately 9,000 units of exclusive lifestyle residences, the majority of which are sized below 1,500 sq ft to cater to homeowners of all income levels. Water-themed parks and pockets of lush greenery create a soothing living environment for residents while various leisure and recreational amenities like the Performing Arts Centre and Wellness area will enrich residents’ lives. The planned 1.5mil sq ft development comprising high-end retail outlets, international hotel, grade A offices, a convention centre, an international school and al fresco dining outlets will make it a hub for tourism and commerce. Indeed, it will be branded as “The Destination” to live, do business and visit in Penang. This will be a thriving, recreational and commercial centre, where all the action is neatly tucked between the Penang Bridge and the newly opened, Second Penang Bridge, the enclave is a mere 10-minute drive to the Penang International airport. Various shopping, financial, educational, and healthcare amenities in George Town are just a 20 minutes’ drive away via the Tun Dr. Lim Chong Eu expressway, while the ferry services also provide an alternative means of connection to the mainland. Located even closer, are the Bayan Lepas Free Trade Zone, Queensbay Mall, Pantai Hospital as well as banks, schools and Food and Beverage (F&B) hubs. The first phase of Penang WorldCity will be Tropicana Bay Residences comprising six blocks of 22-storey condominium towers housing units sized from 455 sq ft to 1,950 sq ft. These are available in eight distinctive layouts. An impressive drop-off point greets residents and guests alike. Inside, one will find the best of resort style living, with amenities like an overhanging pool, tennis court, saunas and a gymnasium. Conceptualised by an international architect, the development is designed to foster healthy, outdoor living as well as, closer bonds between family and friends. To date, Tropicana Bay Residences has received a highly positive response since its initial soft launch, with 90% of units of the first four blocks sold thus far. Block E is now open for registration, with units sized from 872 sq ft to 980 sq ft. The average current selling prices vary from RM769,900 to RM935,900, with an average selling price of RM800 per sq ft.
Certain buildings generate a buzz amongst those in the know, even before the construction work has begun. The Wave at Penang Times Square is definitely one such development. The project blueprint features an extraordinary facade of wave-like contours, rhythmically corrugated around each floor of the unique structure. This aesthetically pleasing form is also functional, as it provides protection from the glaring sun. and, at different angles and during various times of day, the reflection of light gives these wavy panels a spectrum of different shades, creating an illusion of the amazing sea and its magnificent corals. The top component comprises 312 suites occupying 27 floors, which sits on an 11-storey podium comprising car parks, a facilities floor and a commercial retail component. Units are available in four layouts namely, the corner suites (Type A – 1,250 to 1,290 sq ft), intermediate suites (Type B – 1,300 to 1,345sq ft), penthouse suites (Type C – 2,820 to 2,905 sq ft) and duplex suites (Type D – 2,580 sq ft). The varied layouts enhance the feeling that each unit is a limited edition masterpiece. Types A and B units feature three rooms and two washrooms, while Type C has five rooms and five washrooms. Type D, meanwhile, comes with four rooms and five washrooms. Its equally impressive facilities include an outdoor Jacuzzi, wading pool, swimming pool, changing room, sauna room, children’s playground, barbeque pit with wash area, landscaped garden, multi-purpose hall, gymnasium room, exercise station and foot reflexology path. 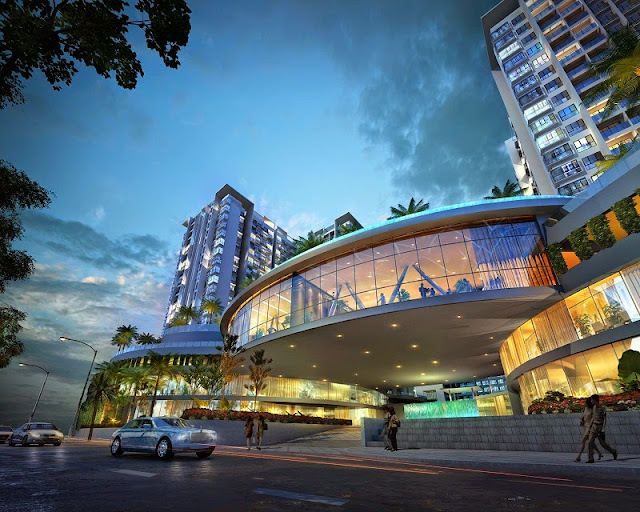 With a limited number of bespoke shop lots, the commercial component of The Peak Residences and The Latitude in Mount Erskine, Tanjung Tokong raises the bar as it is an ideal place for F&B businesses. Serving over 1,500 residential units within the vicinity, these shop lots are a great investment choice as they offer potential for capital appreciation.